I have been slow to update this week but I thought you might enjoy some photos from a park visit a few weeks back. I look forward to sharing a few more from this roll at the end of this week. Hi there Cracker Jacks! I had a lot of catching up to do on your blog, which BTW gets better and better all of the time!! 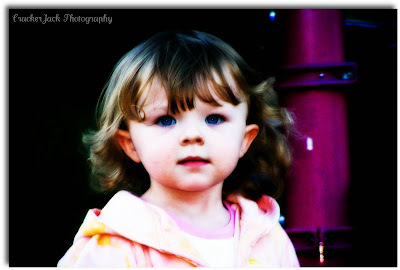 Great pictures of the girls, just look at those blue eyes! What a great concert to go to. I'm glad you guys got to go to it and had such a good time. I'm sure there were people of all ages there to enjoy it. Love the Halloween cookie fun! Such wonderful memories to make with the girls. Thank you for the nice award!!! I just saved it and will put it on my sidebar with pride!!! Congratulations to you on all the awards that you get, fun isn't it?! Very cute. I love pictures of kids on slides. 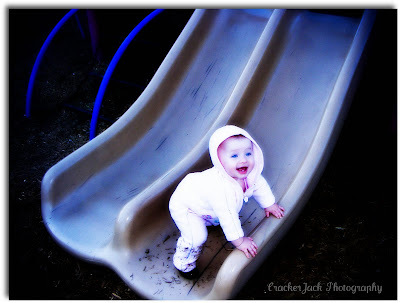 Have you ever noticed that all kids would prefer to go up a slide, rather than down it? By the way, I'm all for setting up an email response system, if you know how to do that -- I'm rather stupid about all things computer. So you tell me where to go, and what to do, and I'm there. I have to say that you would never find this old party pooper at such a loud concert! Glad you enjoyed it! What beautiful pictures! Looks like someone likes the slide!